PocketBook Touch Lux 3 Gold - the special edition of the front-running model in a new sophisticated look. The superior functionality of the well-known PocketBook Touch Lux 3 is framed by an exclusive look to satisfy the high demands of those who appreciate refined style. PocketBook Touch Lux 3 Gold is made in the best PocketBook traditions of high quality and reliability. PocketBook Touch Lux 3 Gold, exactly like the core model, features the latest E Ink Carta™ 6-inch touchscreen with HD resolution (1024 x 758 pixels) ensuring safety for eyesight and providing an excellent reading experience. 8 GB of internal memory and a microSD card slot (up to 32 GB) allow storing several thousands of e-books on the 180-gram lightweight device. PocketBook Touch Lux 3 Gold supports 17 book formats without converting and 4 graphic formats - JPEG, BMP, PNG, TIFF. 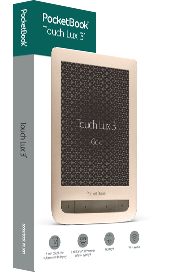 In the library of the PocketBook Touch Lux 3 Gold the user will find 97 preinstalled free e-books in 14 languages (including 7 in German and 8 in English). The preinstalled Abbyy Lingvo® dictionaries are essential for reading books in foreign languages.